There was the award presentation ceremony of the business plan competition held last Tuesday in Akihabara by Mitsui & Co’s venture capital firm. IT journalist Nobuyuki Hayashi, Satoshi Endo from Ascii Research Institute, and Takashi Betsui from CNET Japan were invited as judges for the competition’s awards, I attended the event because interesting persons came together to give their presentation on the stage. 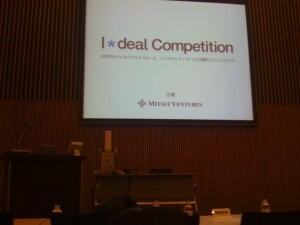 I wrote a story about the event, and contributed it to Asiajin. This year’s MacWorld would get relatively calmer because Steve Jobs was not on the stage, but there’s an event at SixApart HQ near the venue of MacWorld in San Francisco, introducing iPhone Apps made in Japan by the developers themselves coming from Tokyo. Led by famous IT journalist, Nobi Hayashi. As of the time when I’m posting this message, there’re doing the presentation and broadcasting live on uStream as follows. When I was participating Tech Crunch 50 in San Francisco last month, I found a cute Chinese-American girl at an exhibitor’s booth. Unfortunately I forgot to take a shot with her then, but she explained qik, an innovative cellphone stream-casting service. That’s why I dropped her my card. This week I got a custom-made qik iPhone app from them (I think it would be only for TechCrunch 50 attendees), which can be installed onto jail-unbroken iPhone, actually I did. And I ran it on my way to home. It realizes about 250kbps uplink throughput at average, in the bus travelling as fast as 50 kilometers an hour. Its motion comes up smoothly. You may bring a live streaming with an iPhone device alone. Both visual and audio quality are not so bad. Because qik may cause overload to cellphone network and cellphone carriers claimed it to Apple, qik application is not available at iPhone AppStore. Then I found an interview of Mr. Miyakawa, Softbank Mobile’s CTO. Softbank Mobile will start discount sales of Planex WiFi routers in order to reduce the traffic of the company’s cellphone 3G network, but I think they had better distribute FON routers for free instead. And if they distribute it together with Yahoo BB’s ISP contract, they earn the money in an entire company group, although cellphone carrier and ISP are different Softbank’s subsidiaries. Let me say it again, qik is a completely good work. When we watch TV live programs covering F1 car race championships, we see live pictures by “on-board camera” which is embedded in running cars. Similarly, how about marathon runner’s neck-hanging iPhone with qik application? It enables livecasting at the level of athlete’s sights as TV watchers would be running together with, and it gains a sense of really being there. If a number of runners use qik with iPhone at huge events like Tokyo Marathon and Oume Marathon, for instance, it would be very interesting as social movements, but Softbank Mobile will give up to keep the service availability. I wonder if IBM’s WiFi handover technologies would be spread over more in the near future to solve the problem. I’ve been drinking until dawn last night, and I was still sleeping even noon. Then I got a call from a friend of mine. Friend: Shall we go to “DEMOsa”? I : I don’t know what it is. Too sleepy to be there, I’m staying in bed. I became sleepy again and refused going to Roppongi, but I thought it again and decided to be there after getting a hot shower, for responding to his kind invitation. There were a lot of people whom I know. Every developer gave there the presentation about his or her newly introduced iPhone App for ten minutes. Its rapidness and smoothness of the presentations going made me so cheerful.